I just read the article from today that the February security patch is rolling out so figured I would check for the update and there it was. I'm on the Verizon model and didn't think it would be available for update so quickly! raqball and droidman2177 like this. I got it as well.. Mine is a Google Store Pixel..
Got it on my Verizon Pixel. Waiting for it on the 7.1.2 beta. Downloading it now on my Verizon 32GB. I got the update too. It's a security update so nothing special. But there was a game (Kingdom Hearts unchained x) I sideloaded and after the update it refused to run. Kept force closing. ¯\_(ツ)_/¯ not a huge deal, but a little annoying. Updated this morning. Now I can't make/receive calls or texts. On AT&T with unlocked Pixel XL.Worked great yesterday. Me too - BUT - did get it on VZW non-beta Pixel yesterday. Wonder if betas don't get updates - ??? They do. We just may have to wait longer. Updated mine last night, unlocked google store version on At&t, no issues here. Verizon version of Pixel XL updated, no issues (beyond the on going connectivity ones) that I see. 2. Double check the APN settings? Can anyone verify? i can't download the update currently because I am in the beta version. I'm not sure how I feel about Google's updates and patches. This is the third time something odd has happened after a patch. 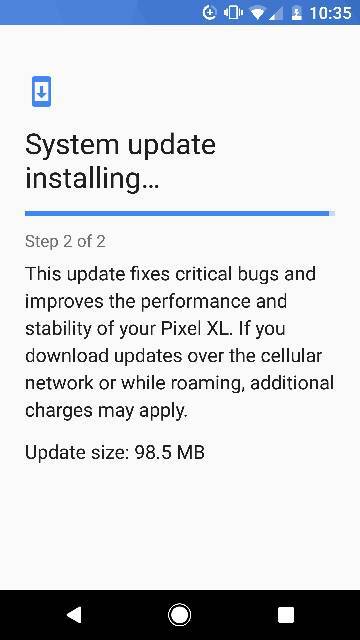 I haven't received a Security patch for my Pixel using T-Mobile. Is this just for VZ users? Just got mine this morning. Waiting for the phone to tell me to reboot. Yeah I couldn't remember from when I tested on the 6P. I actually talked about it with Aquila this morning and he believes what you said -- we won't get it till the next build update. How to remove the white software update box under settings on S6 Edge+ SM-G928? Any way to send feedback to LG after app not working after update?